The Middle Of The Week Has Never Been Better! 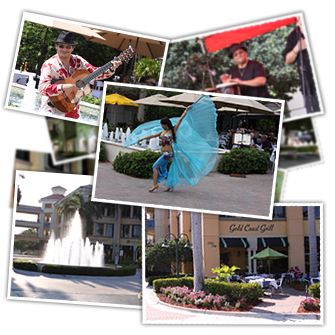 Join us every Wednesday evening from 6pm to 9pm for food, fun, and entertainment! Every Wednesday we present some of the hottest acts in South Florida performing mixes of the classics and popular music. Stages are set up in front of the large fountain in the center of the plaza. Admission is always free and kids of all ages are welcome. Stroll through the many shops and fountains, grab some dinner at one of our many restaurants, or just indulge in some handmade chocolates. Whatever you decide, come to "The Walk on Wednesday". There is simply no better place to be.